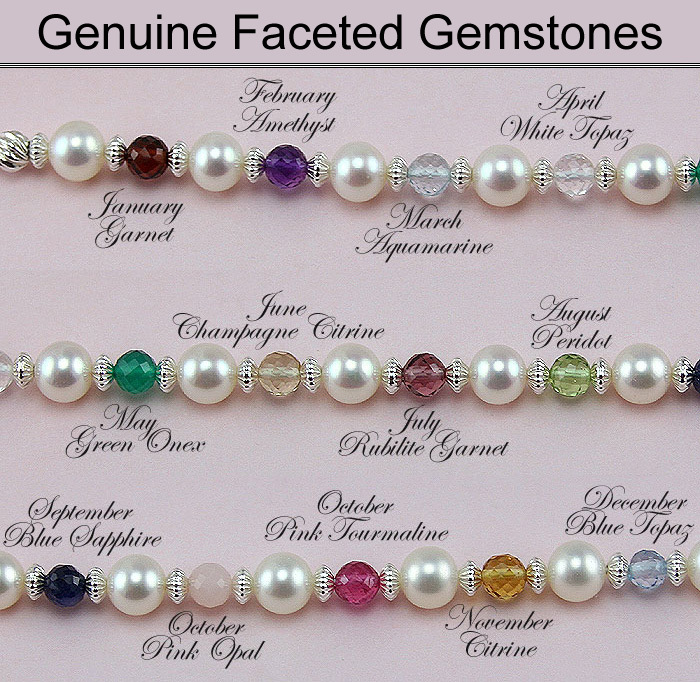 At BeadifulBABY we offer a gorgeous selection of high-quality genuine gemstones for use in our beautiful custom jewelry. These stones are naturally-occurring gems mined from the earth. We offer multi-faceted and smooth-polished gemstone bead options. Whether you looking for a specific child's birthstone or just want to pick a favorite gem or color we've got you covered. We do not use lab-created or simulant gemstones in our custom jewelry. Read more about the fine quality materials and components we use at BeadifulBABY. Many jewelers are misrepresenting the gemstones they offer by omitting the words laboratory-grown, laboratory-created, synthetic, imitation, or simulated stone when using the terms "gemstone", "birthstone", or the name of the gemstone by itself. A jeweler or company selling jewelry cannot use the terms "gemstone" or "birthstone" by itself to refer to a lab-created gemstone unless they precede the words "gemstone" or "birthstone" with the term lab-created or a similar term referring to lab-created. The terms "gemstone" and "birthstone" by themselves should only be used if the gem or gems being described are natural. Often times companies will add a tiny little footnote mark next to the gemstone name to try and get around being perceived as unethical. The FTC is very clear in its guidelines - if a gemstone is lab-created the gemstone name must be preceded with the term lab-created or a similar term. Not preceding the gemstone name or the term "gemstone" or "birthstone" with a lab-created term implies a gemstone is natural. This unethical practice occurs both online and in reputable jewelry stores. Usually this is just an oversight, but sometimes the omission is a deliberate attempt to mislead potential customers. A great majority of gemstones for sale today are lab-created. Lab-created gemstones have vivid, vibrant colors, and often have no internal inclusions. This perfection misleads shoppers into thinking fine natural gems must be perfect. For example, genuine crisp and clean emeralds with no eye-inclusions do not exist naturally. Genuine emeralds will always have inclusions and are often hazy in appearance and not clear stones; however many companies sell lab-created, non-included, clean, crisp emeralds as natural genuine emerald gemstones. This unethical practice misleads customers - and is very common in the jewelry industry. Ruby is another gemstone often misrepresented. Ruby's are often fracture-filled with leaded-glass to disquise or remove inclusions. This is a very common practice and is unethical. Another deception is to use spinel to impersonate genuine ruby. Some laboratories have gotten clever and are creating lab-created gemstones with actual inclusions making it increasingly hard to dicern the natural gems from the lab-created non-natural gems. The FTC is very clear on how gemstones should be represented. The following paragraph comes directly from the FTC jewelry and precious metal guidelines section 23.23. § 23.23 Misuse of the words "ruby," "sapphire," "emerald," "topaz," "stone," "birthstone," "gemstone," etc. (a) It is unfair or deceptive to use the unqualified words "ruby," "sapphire," "emerald," "topaz," or the name of any other precious or semi-precious stone to describe any product that is not in fact a natural stone of the type described. We strictly adhere to the AGTA Code of Ethics and Principles of Fair Business Practices and the Federal Trade Commission (FTC) jewelry and precious metals guidelines. The FTC states you must use the term "cultured" when referring to cultured pearls. Merely referring to a pearl as a "pearl" instead of a "cultured pearl" implies the pearl is natural.